Perfect Cut For Curly Hair - What to Ask For? I always dread going to the hairdresser as they always cut my curly hair too short making it more difficult to manage as it becomes very bushy. I wear my hair down alot and I would like to get it trimmed with a few layers possibly to give it a lift and to make it look a bit different. Is it a good idea to get layers on curly hair and what kind of layers do I ask for?? Try to find a hairstylist that used rounded scissors or uses the helix cut. I had my hair (which is thick and curly/wavy) cut and they actually cut curl into my hair so that it all went together nicely and I didn't end up with the "Christmas tree effect" when it grew out. I also have curly hair. And understand what its like to get it cut, its hard on what to ask for because straight haircuts don't look good on us. But I will say one thing that always looks good on my lovely locks is layers. Layers are great! My hair used to curl up more on the bottom than it did on the top and make this huge chunk of curls, so i got layers, snip-snip, problem solved. 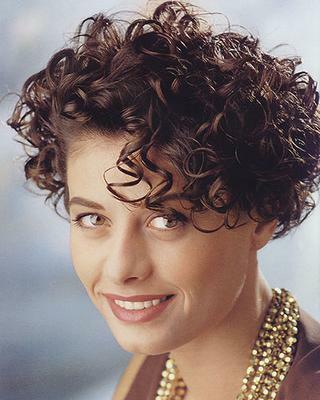 Deirdre, Its always best you choose a senior stylist that have more experience with curly hair. It is very easy to cut too much off when hair is wet and some stylists have not enough experience cutting curly hair. Depending on your type of curl, layers can remove bulk and add more manageability to your style. Ask for longer layers. Join in and write your own blog page! It's easy to do. How? Simply click here to return to Curly Hair.